When Fall comes around, I embrace the color changing trees, oven baking and Thanksgiving!! So as I start planning my favorite holiday meal... I drove past the changing of the leaves on the trees and this card came to life. 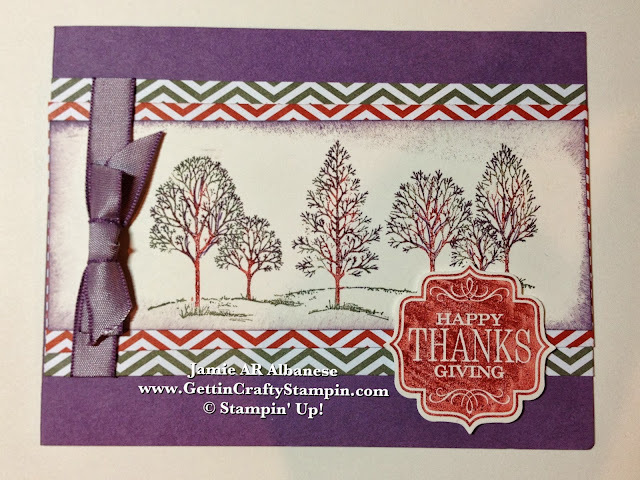 Loving a multi-colored technique with my Stampin' Write Markers (#131264), Color Coach (#130118) and Regals Collection Designer Series Paper Stack (#130139) for this fun and trendy card. Pairing Cajun Craze with Perfect Plum and Always Artichoke. Using our Lovely as a Tree (#128655) for this classic tree landscape. Layering over the Always Artichoke and Cajun Craze chevron patterned paper from the Regals Stack. 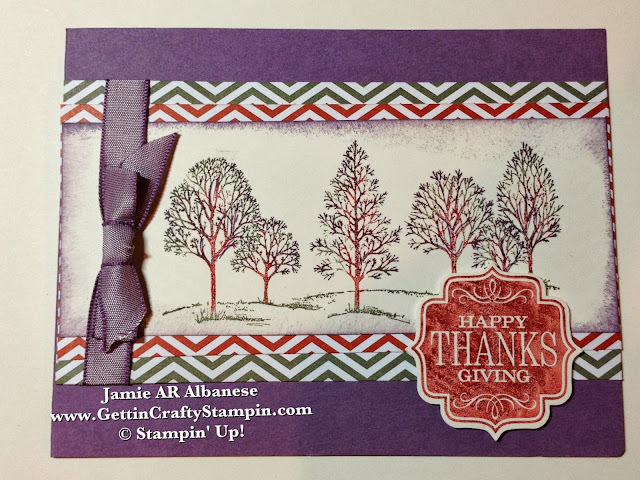 Softening the edges with the Perfect Plum ink (#126963) and our Stampin' Sponges (#101610). Tied together, this Perfect Plum Taffeta Ribbon for a color coordinated, polished look. I'm 'falling over' with joy that you came by today! I hope that you come by often and visit as I try to post daily. Go ahead, bring your friends and family to the celebration, too, and don't forget to Share me!! Happy Fall Y'all!! Thanksgiving is soon to happen upon us. Go ahead, start preparing to celebrate. Toast Fall, the changing of the leaves and the upcoming yummy menu! Drive about and get excited about the changes in nature... and capture those moments with some fun crafting! Thanks for coming by... let's celebrate Fall together!